Amazon have released a version of their Author Central today for Kindle Paperwhite and Kindle Fire HD - they have allowed book authors to set up an "About Me" profile for some time, I had already updated my profile as author of An Introduction to Business Systems Analysis. What I hadn't done before is check out some of the new features that are available to authors. 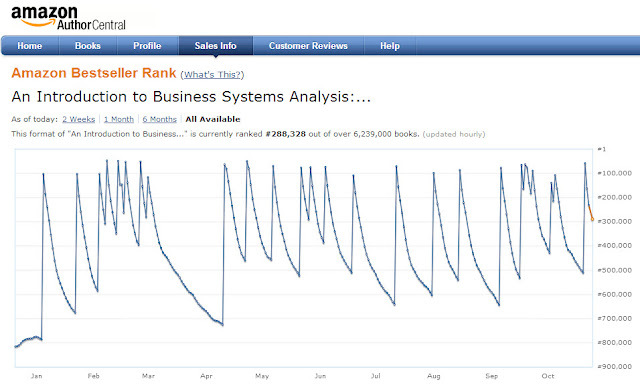 Author Central provides "Sales Info" details - so far this is just the bestseller rank, no doubt in future it will provide more detailed analytics. For my own modest single book publication I can see today that my booked is ranked #288,328 on the bestseller list today, that's down a whopping 58,137 places since yesterday. On drilling down a little deeper I can see the ranking for all of 2012 and that the ranking jumps up and down quite a lot. The highest position in 2012 was at the dizzying high of #46,523 on February 8th last (#779,025 was the lowest). I suspect that each peak is a single sale of the book, there are 25 peaks which indicates I've sold 25 books through Amazon over the past year! The Amazon page indicates that there are over 6,239,000 books in the bestseller rank list. At least my book is in the top 5%, which also tells me that an extremely modest number of sales gets you high up the list, and also that Amazon list an awful lot of books that don't sell very much at all. Expect Amazon to step up their publicly and author available analytics in the near future.